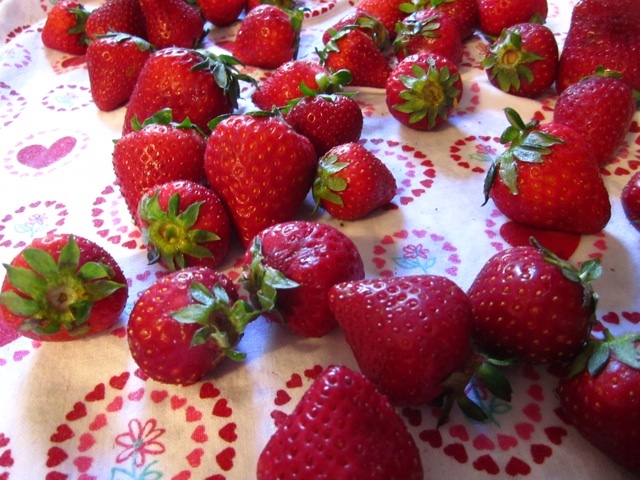 Each year, I have a tradition when strawberries appear at the farmers’ market. That tradition is to buy my weight in these juicy red gems and challenge myself to eat every last one before they have the chance to go bad. What I’ve discovered as a result is that strawberries are a wonderful accompaniment to nearly every kind of food. Salad, smoothies, oatmeal, cereal, fruit salad. Or, as we see here, in a pie. This pie is unique because it’s somewhat of a hybrid. It resembles a tart – with the shortbread crust and the uncooked fruit, and yet has all of the deep-dish fullness of a hearty pie. The chocolate lining was my own addition to the original recipe. It seemed like there needed to be a little something between the crust and the strawberries – at first I thought some kind of custard would do the trick well. 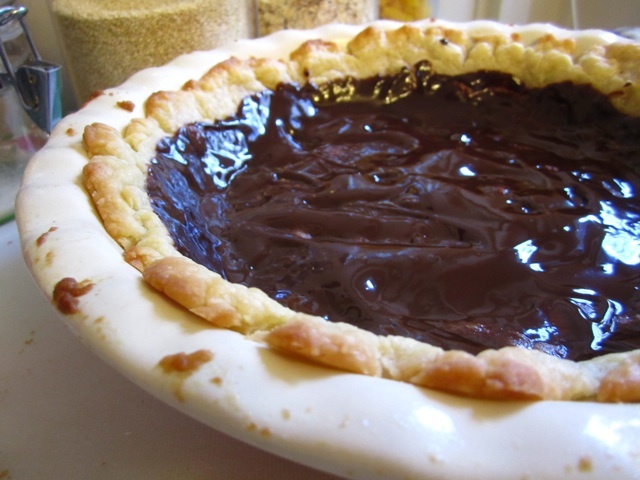 I wanted to keep this pie as simple as possible, though, and there’s nothing more deceivingly simple as melted chocolate poured into a pie crust. It’s nearly impossible to fail and it’s as easy as, well, pie. 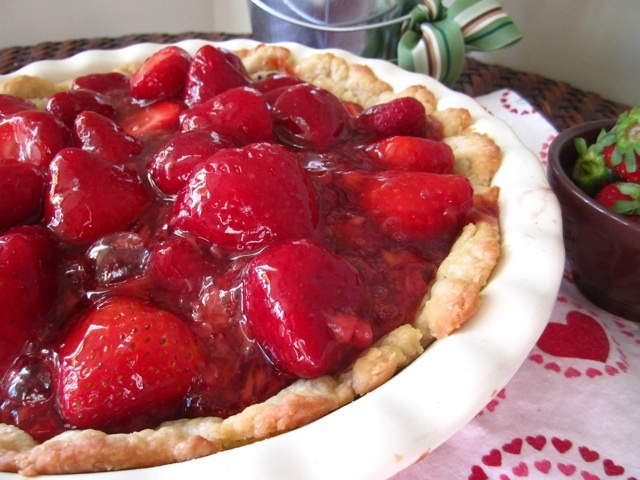 I’ve already bookmarked several more strawberry-centric recipes to crank out in the coming weeks. The greatest thing about baking with strawberries is that they’re so darned photogenic. Could this glistening pie possibly be any prettier? Sift together flour, powdered sugar, and salt into a bowl, then cut in margarine and work into a crumbly dough (you may want to use your fingers to rub the mixture together). Add more flour if too wet, or a few drops of oil if too dry. Press mixture into the bottom and up the sides of a 9″ pie pan. Chill for 30 minutes in the fridge or freezer. Preheat oven to 375°F. When crust has chilled, prick the bottom and sides all over with a fork. Bake for 15- 20 minutes, until a light golden brown all over. Remove and let cool. After the crust has cooled for a bit, melt chocolate chips together with milk in a double boiler or in a metal bowl resting on a pan of simmering water. Stir constantly until all the chocolate has melted. Pour into the cooled pie crust, spreading evenly with a spatula to cover the bottom and a little ways up the sides. Place in the fridge to cool. Now make the strawberry filling. Mash enough of the berries to measure 1 cup. Place remaining berries in a large bowl. In a medium saucepan, whisk together sugar and cornstarch, then gradually whisk in water and then crushed berries. Cook over medium heat, stirring constantly until mixture thickens and boils. Boil and stir 1 minute. Cool for 10 minutes, then pour over berries and gently turn to coat. Transfer to pie crust and chill in the fridge at least 3 hours or until set. Tip: When you slice into the pie, do so with force. Cut right through the berries rather than attempt to go around them. 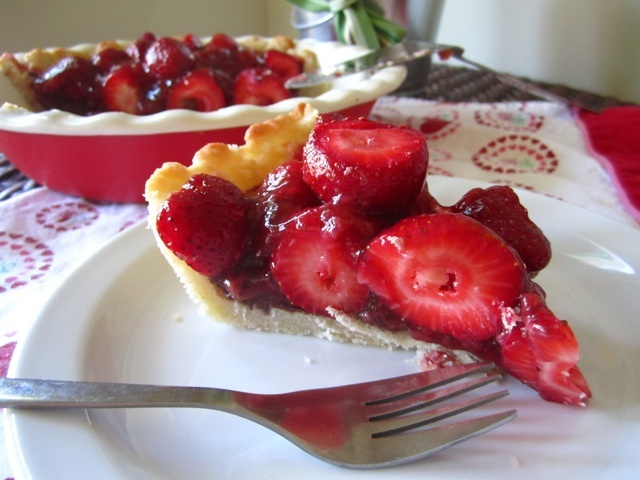 This entry was posted in Pie, Vegan and tagged chocolate lining, pie, strawberry, vegan. Bookmark the permalink.